Instructions: This calculator allows users to conduct analysis similar to that presented in the Federal Reserve Bank of Minneapolis Economic Policy Paper (13-3), “Quantifying the Costs of Additional Regulation on Community Banks,” by Ron Feldman, Ken Heinecke and Jason Schmidt. Please review that paper for additional details on the analysis allowed by this calculator. 1. Bank asset size cutoffs. 2. Number of full-time equivalent employees (FTEs). 3. Compensation of FTEs. 4. Year on which the analysis is performed. This version of the regulatory cost calculator contains updated data through Q4 2013. Note that results for the 2001-2012 period are slightly different due to revisions to the call report data and seasonal adjustment of the CPI. Note: Click the Enable Content or Enable Macros button when the file opens to allow the calculator to appear. via Regulatory Cost Calculator – The Federal Reserve Bank of Minneapolis. In this Economic Policy Paper, we quantify the cost of increased regulation on community banks. We do so by modeling the impact of new regulatory costs as the hiring of additional staff, resulting in higher total compensation and lower profitability. We then analyze the changes in the distribution of community bank profitability. Banks may respond to regulation by increasing training, by shifting staff to activity that generates less revenue or by doing nothing differently. In all cases, the bank’s response will manifest itself in lower profits, as if the bank altered its head count. By way of example, we find that the median reduction in profitability for banks with less than $50 million in assets is 14 basis points if they have to increase staff by one half of a person; the reduction is 45 basis points if they increase staffing by two employees. The former increase in staff leads an additional 6 percent of banks this size to become unprofitable, while the latter increase leads an additional 33 percent to become unprofitable. This approach to quantification has three main advantages. First, it captures the “bottom line” from a wide range of regulatory cost effects. Regulatory costs may not manifest themselves as the hiring of more staff. Such costs could present themselves as less revenue, since staff may spend more time on non revenue-generating activity. Alternatively, training expenses for staff may increase. Regardless, our approach to quantification captures the full range of increased costs or lower revenue, as both result in lower earnings. Our approach has a number of limitations. Our approach does not measure any of the “psychological” costs of increased regulatory activity; account for dynamic changes in the risk-taking of banks (e.g., the bank takes on more risk in response to higher fixed costs); recognize the potential that new regulation could increase firm profitability by, for example, increasing confidence in the banking system. The smaller institutions tend to be older, somewhat more highly rated and more rural, and to have higher agriculture-related loan concentrations. The smallest community banks—those with assets less than $50 million—also have noticeably lower profitability levels. 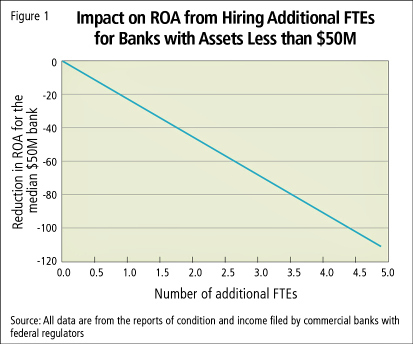 Hiring of one FTE reduces ROA by approximately 23 basis points for the median bank with assets below $50 million. For this stylized example, we assume that the compensation costs for each additional FTE are $70K for rural banks and $90K for urban banks. 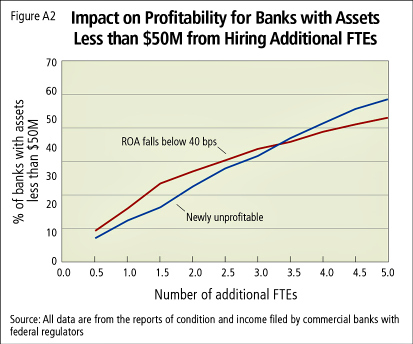 2 Each additional FTE reduces the median bank’s ROA by the same amount. For example, if a bank in this size category needed to hire four FTEs, the change in ROA would be roughly 90 basis points. Assuming compensation of $42K and $54K for staff in rural and urban markets leads to a reduction in ROA of 13 basis points for the median bank with assets below $50 million if it were required to hire one FTE. Each additional $7K in compensation costs reduces the median bank’s ROA by approximately 2.25 basis points. For example, if a rural bank needed to pay $91K in compensation costs for the incremental FTE, the change in ROA would be nearly 30 basis points. To do so, we utilize a representative scenario in which we impose a proportionally higher regulatory cost burden on smaller banks. That is, a smaller bank has a relatively higher cost of regulation compared to a larger bank. This approach is consistent with research that suggests fixed-cost and economies-of-scale components to regulatory compliance.3 In this scenario, we also report the new hypothetical hires due to additional regulation as a percentage of the number of FTEs at the median firm within each banking size cohort. As designed, the impact on profitability is most significant for the smallest institutions. 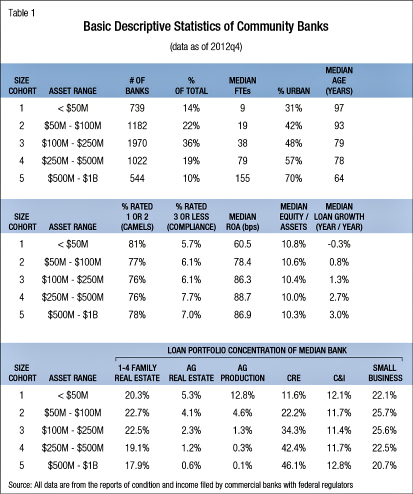 The median bank with assets below $50 million would experience a drop in ROA of nearly 23 basis points, while the median firms in the larger size cohorts would encounter a decline of 11 basis points or less. via Quantifying the Costs of Additional Regulation on Community Banks – Economic Policy Papers – Publications & Papers | The Federal Reserve Bank of Minneapolis. PADUCAH, Ky., Nov. 6, 2013 – Computer Services, Inc. (CSI) (OTCQX: CSVI), a provider of end-to-end technology solutions that empower financial institutions to remain competitive, compliant and profitable, today announced its ranking on the 2013 FinTech 100. The annual international listing, published by American Banker, Bank Technology News and research firm IDC Financial Insights, ranks the top hardware, software and service providers that derive more than one-third of their revenue from the financial industry. CSI rose to 56th on the list of financial technology companies that were judged according to their global revenues–attesting to the company’s stability and importance within today’s financial industry. During the past year, CSI has experienced multiple defining milestones as an organization, including the addition of its largest core customer in company history, the rebranding and introduction of former affiliate ATTUS Technologies as CSI Regulatory Compliance, and a record 100 percent contract renewal rate among its NuPoint core customers. Overall, these achievements have enabled CSI to represent more than 5,000 customers by more than 1,100 employees within its 23 locations across the United States. via CSI Named Among Top 100 Global Providers of Financial Technology. What Does the D&H / Harland Acquisition Mean For Community Banks? In a deal valued at $1.2 billion, Davis and Henderson Corp. announced its planned acquisition of Harland Financial Solutions. Davis and Henderson, or D&H, is a Canadian technology company only vaguely familiar to US banks and credit unions through its Mortgagebot loan origination product which they acquired in 2011. With the acquisition, D&H will add a little more than 5,000 US banks and will have combined revenue of $1 billion. That will put them at roughly the same revenue as Jack Henry. 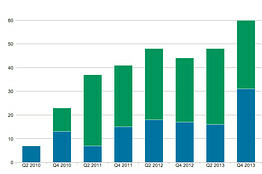 D&H is a strong company in lending technology. MortgageBot is strong, and they have an integrated commercial/consumer/mortgage loan origination system (Cyence) that is stronger than Harland’s Credit Quest and Decision Pro. But D&H has traditionally been geared toward large banks from a price and tech resources standpoint. D&H will be new to the core processing, Internet banking, and online account opening business. Yikes. We know how that’s worked out with other vendors before, but unfortunately Phoenix, Ultradata, Sparak, Intrieve, Cavion and uMonitor customers are used to being bounced around and being promised more development dollars. I’d be particularly worried that Phoenix and Ultradata core will continue to remain in no man’s land with yet another owner that doesn’t know the core processing business. Maybe D&H will actually deliver on Harland’s promises, but I wouldn’t expect major development dollars for a while. History has taught us that vendors will typically focus on integrating their legacy products with their newly acquired ones before they start to tackle new developments in the acquired products. I hope I’m wrong. In five years, D&H will have grown from 100 customers to nearly 6,000. That’s impressive if you’re a shareholder and frightening if you’re a customer. I hope their management team consists of superstars. My quick read on the financing of this deal is scary. At year end, D&H only had $5.5 million in cash. Goodwill and intangibles make up 86% of their assets. So how are they financing a $1.2 billion acquisition? D&H has said that it will finance it, in part, by raising nearly $600 million through the sale of subscription receipts and unsecured debentures. D&H’s leverage is already sky high and its liquidity is very low, so it will be important to know how much of that $600 million will be additional debt. We’ve seen several highly leveraged core processing acquisitions before and none of them survived. Unless I’m reading this incorrectly, I’d be very, very worried about this. Harland customers, it’s hard to believe this, but your vendor management financial reviews might have just gotten uglier. The transaction is slated to close about August 19, 2013.
via What Does the D&H / Harland Acquisition Mean For Community Banks and Credit Unions? Article by Brad Smith.